Bryant and Kristin Young boldly exemplify fighting for futures. 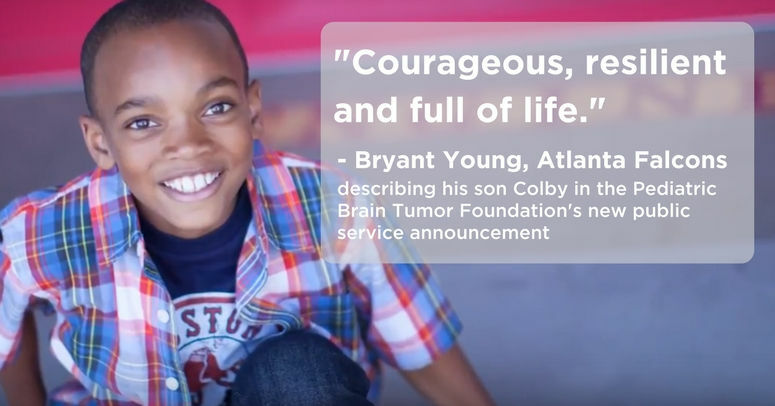 Through their hearts, talents, time and platforms, the Young family joins the Pediatric Brain Tumor Foundation’s mission in memory of their son Colby. Colby passed away last year at just 15 years old. So that other families do not have to face the unfathomable, Kristin and Bryant have teamed up with the PBTF to raise awareness and funds through a new public service announcement and fundraiser for Giving Tuesday. A four-time Pro Bowler, four-time All-Pro pick and Super Bowl XXIX champion, Bryant was the San Francisco 49ers’ defensive tackle for 14 years. He recently returned to the NFL as the Atlanta Falcons’ defensive line coach. As owner of Kristin M. Young Photography, Kristin uses her talents in film photography to tell families’ stories and raise awareness about pediatric brain cancer. Earlier this year, she joined the PBTF Board of Directors and Bryant was named the organization’s special ambassador. In addition to this new PSA, the Young family are participating in a Giving Tuesday fundraiser for the PBTF. On Nov. 28th, childhood brain tumor advocates like the Youngs will turn to Facebook to fundraise for a cure. Starting at 8am ET on Nov. 28th, the Bill & Melinda Gates Foundation will match up to $2 million of funds raised by U.S. nonprofits on Facebook and donation fees will be waived all day. "One reason we decided to continually support PBTF is because of their commitment to not just much needed research and new treatment methods, but also helping cancer’s smallest victims and their families thrive during and after treatment for brain cancer," writes Kristin on her Giving Tuesday fundraiser. "We have directly benefited from PBTF’s mission and hope to help extend the same hope to others that they gave to us." The Young family’s PSA is the latest in a series of videos produced pro-bono by PBTF partner Jokes4Miles. Inspired by teenager Miles Austrevich and his love of comedy, Jokes4Miles began as a way for friends and family members to share jokes and well-wishes throughout Miles’ battle with brain cancer. It quickly gathered momentum, attracting major media attention and participation by celebrities. “Despite its severity, Miles’ illness never deﬁned him. He has impacted people all over the world, turning something as simple as laughter into an inspiring mission to help others,” says Jeremy Caplan, Jokes4Miles co-founder. In memory of Miles, these filmmakers, artists and volunteers continue to donate their time and talents to create customized media for other children with cancer and nonprofits like the PBTF. Through this video and fundraiser, both Jokes4Miles and the Young family show that all of us can make a difference in defeating pediatric brain tumors when we work together. Visit http://bit.ly/PBTFGivingTuesday2017 to join the Youngs and other childhood brain tumor advocates on Giving Tuesday.